It is a bitter reality that all around the world, there are elderly people living alone and independent of their family members. Modern age has made many of us so busy at times that we forget (or neglect) spending enough times with our beloved ones. Yet, it is in this stage of life where one is more prone to health threats and in need of attention than ever before. Living in retirement resorts is often against self confidence and other daily home nursing options are too expensive, if not intrusive, to think of. Yet, in this modern age of technology, cannot we propose any affordable solution that allows constant supervision of the elderly by their trusted physicians while respecting their privacy and preserving their independence? To tackle the above-mentioned challenge, we propose Sloth: An end-to-end wearable activity recognition system that allows real-time monitoring of activities of daily living. Sensor-based activity recognition blends wearable computing with internet of things to create a wireless network of small-sized embedded sensor platforms that can detect activities of daily living (e.g. walking, eating, cooking, writing) in real-time and over a long period of time. 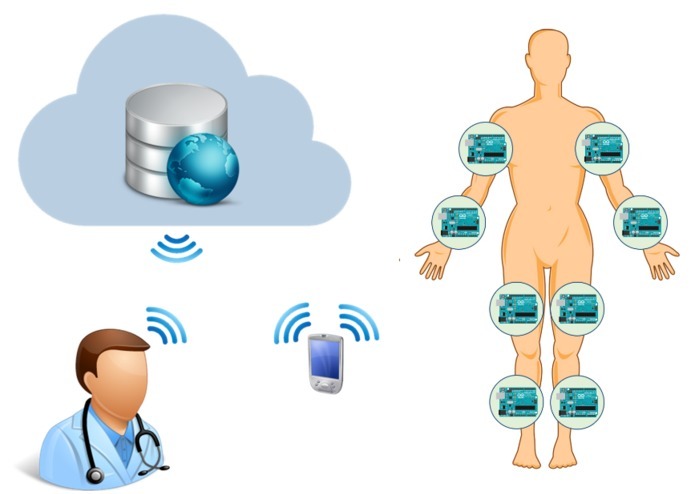 Attaching a few accelerometers to different body parts, we aim to collect human physical motions and transmit them to a central node where we can interpret the type of activity being performed and transmit it to the cloud where it can be accessed by privileged users. Our plan for the 12-hour hackathon competition is to start with a partially-developed recognition algorithm and eventually turn it into a ready-to-try proof of concept product which interested people can wear, conduct random activities and check how Sloth detects them in real-time on a deployed website. To realize this, efforts must be made both in software and hardware. We need to solder the accelerometers to the boards, configure xbee sensors and integrate the wearable components into a jacket. Furthermore, we will take advantage of an open-source github project to develop the recognition algorithm. Implementing the machine learning algorithm and developing the information processing logic will take an estimated 3 to 4 hours. We will also need to design a website from scratch which includes development of database, API, back-end and front-end development that allows user authentication and real-time updating of patient information without the need to reload the web-page. Once our development is over, we need an estimated 1 hour to teach the system different activities of daily living. Anyone interested in the concept is more than welcome to join. Software Engineer by day. Software Engineer by night.